March 9 Update: An additional 0.8" through this morning brings the seasonal total to 79.5", putting it in 7th place, behind the 1961-1962 amount of 81.3". March 7, Noon CST Update: The storm total of 2.1" through this morning puts the seasonal total in sole possession of 8th place with 78.7". March 6, Midnight CST Update: The 1.7" of snow on Sunday brings the seasonal total to 78.3", still 0.1" below 8th place 1966-67. March 6 Update: The overall snow season at Minneapolis extends beyond the meteorological winter months of December-February. For the entire season, the 76.6" to date is in 9th place. The record amount was 98.6" in 1983-84, so it would require nearly 2 feet more in the remainder of March and April in order to break the seasonal record. 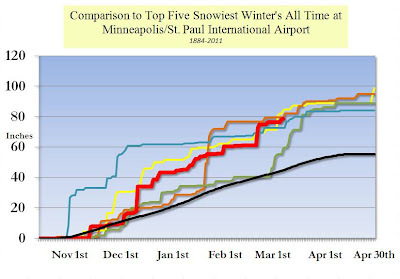 The National Weather Service reports that the 66.7" of snow for the 2010-11 meteorological winter (December-February) was the second largest amount on record at Minneapolis. The record snowiest winter was in 1966-67, when 71.7" fell. It was also the 4th wettest winter on record. The 4.91" of precipitation was 173% of normal. The average winter temperature at Minneapolis was 1.6° below normal. As the 58th coldest winter, it was near the middle of the range for the 140-year climate history of Minneapolis. 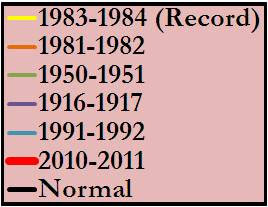 The average daily high temperature was 3.0° below normal (36th coldest), but the average low was only 0.1° below normal. St. Cloud had its 4th snowiest winter on record with 47.5" of snow, and the 4.35" of precipitation was also the 4th wettest on record. 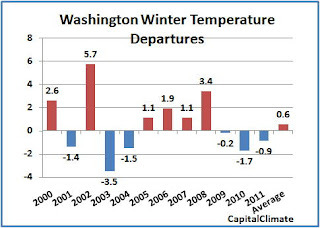 With a high temperature of 72° on Monday, February 28, Washington's meteorological winter of 2010-11 ended on a distinctly warm note. The daily high was the 4th one of the month at or above 70°. It was the greatest number of 70° days in February since 1997, when there were also 4. Despite a stretch of 5 consecutive days below average in the second week, the February average temperature of 41.7° was 3.6° above the climatological mean. Although there were 16 days with lows at freezing or below, there were no days with highs below freezing. On average, there are 17 days with lows at or below freezing and 2 such highs. February is now the 11th month out of the last 14 with above-average temperatures in Washington, following cooler-than-normal readings in December and January. It was the warmest February average since the 42.6° in 2002. 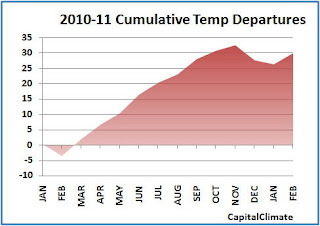 Despite the slight dip in December and January, the accumulated temperature departure since January 2010 has rebounded to 30°. Averaged over the 14-month period, that's over 2° above the climatological mean. 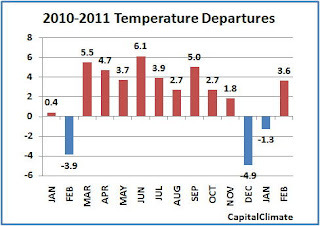 For the winter overall, temperatures averaged 0.9° below normal. It was the 3rd consecutive below-average winter in Washington, but 6 out of the 12 winters since 2000 have been above average, and the mean for the century to date is +0.6°. Despite the relentless pimping of the s-word by certain eyeball-hungry local media outlets, the warm temperatures combined with below-average precipitation of 2.12" to produce a mere 0.5" of snow for the month. The greatest amount in a 24-hour period was 0.2". As has been noted here in the past, March snow is not unheard of in Washington, with double digit amounts on a few occasions, and the all-time daily record was set as late as the 29th. Nevertheless, the current seasonal total of 9.9" of snow is 28% below the normal amount to date. A snowless March would add about another 10% to that deficit.